We will use the writings of John Berger (b. 1926) to introduce this second part of the blog. Berger is an English art critic, novelist, painter and poet. He has has written subtle and insightful articles about photography, art, politics, and memory. The two works of Berger that are relevant to ECG evaluation are "Ways of Seeing" and "About Looking". He is perhaps best known for Ways of Seeing (WOS). About Looking is a collection of essays by John Berger, first published in 1980, in which he explores our role as observers to reveal new meaning in what we see. One of the essays is "Why Look at Animal?". This dealt with the cultural and symbolic links between animals and man, the economic links, and the practical value of domestic (or domesticated) animals. This long established relationship between man and beast has been reduced in industrialised societies in the twentieth century to looking at each other in zoos (Figure 1). This change has also resulted in an increasing number of household pets, animal farms and "cute" You Tube videos of pets. Berger's essays and ideas discuss cultural and aesthetic issues that seem unrelated to the (apparently) objective process of ECG evaluation. However we can link the title of two works to summarise the "nuts and bolts" of ECG evaluation: 'Ways of Seeing' ⇔ "About Looking'. Figure 2 has a photograph taken by the American photographer Lee Friedlander, part of a series of photographs of television screens that he took during the 1960s. This picture was taken in 1962. The series was called The Little Screens, and first appeared as a 1963 picture essay in Harper’s Bazaar, with commentary by Walker Evans. Six untitled photographs showed television screens broadcasting glowing images of faces and figures into unoccupied rooms in homes and motels across America. Between 1963 and 1969 the series grew but was not brought together in full until a 2001 exhibition at the Fraenkel Gallery, San Francisco. The cover of the Penguin edition of WOS had a painting called the Key to Dreams, one of a number of works with the same title by Rene Magritte (1898-1967). Rene Magritte was born in Belgium and came from a petty bourgeois milieu in which keeping up appearances was of prime importance. A crucial childhood experience was the suicide of his mother, who threw herself into the River Sambre in 1912 and whose body was not found until weeks later. His always dapper attire, his bowler hat, and the small, humble apartment with studio in the living room provided a facade of normality that jarred with the enigmatic and unsettling paintings of ordinary scenes or objects. One of Magritte's well known images is The False Mirror Le Faux Miroir (Figure 2). The picture shows an enormous lash-less eye with a luminous cloud-swept blue sky filling the iris and an opaque, dead-black disc for a pupil. The title, provided by the Belgian Surrealist writer Paul Nougé, suggests there are limits to optical vision: a mirror provides a mechanical reflection, but the eye is selective and subjective. Magritte also challenged the traditional way of linking (or sharing) words and images in the same frame. This link is not as linear or concrete or straightforward as we assume. The point is well made in his painting Key To Dreams 1935 (Figure 2). In this picture there are four frames, one image in each frame, and a word in each frame. The word and the object only (seem to) correspond in the lower right hand frame. The ECG has (superficial) similarities to the Key to Dreams series of paintings: there are different frames with different images that can be described by various terms. The interpretation of ECGs and the works of Magritte also deal (in different ways) with semiotics: "the study of signs and symbols and their use or interpretation"
Note: I Dream of Jeannie was a fantasy situation comedy (sitcom) that described the relationship between a 2000 year old female "genie" (a supernatural entity [spirit] that had free will, could become invisible, could take on a physical form, and had aspects of a guardian angel) and an American Astronaut, who become her master. It was shown on American TV between 1965 and 1970, with the [predictable] outcome that the 'genie' falls in love with the Astronaut. "I’m an eye. A mechanical eye. I, the machine, show you a world the way only I can see it." A standard ECG has 12 leads (13 if you include the rhythm strip). Each complex in each lead has at least 7 named parts (P-Q-R-J-ST-T-U) which may have up to 4 variables (size - shape - position - duration). At a heart rate of 100 beats per minute there will be about 4 complexes in each lead. The data that is potentially available for analysis in a 12 lead ECG is (12 x 7 x 4 x 4) items i.e. 1344 items. These items create a data noise that can drown out the signal (the main diagnosis/diagnoses). It is impossible to assess or analyse every squiggle or contour in the ECG: a systematic approach is essential. Looking at an ECG is not a "passive" or "neutral" process - it is complex and often stressful. It is an active process. The way we look at an ECG is influenced by learnt assumptions and previous experience. You are given an ECG with a lot of "noise" (data), often in a challenging clinical situation, and have to make a decision (diagnosis or course of action or both) in a short interval. The Sin of Diagnostic Greed (aka the Over-analysis Syndrome [OAS]). A popular quote by Lyndon Baines Johnson (LBJ), the 36th president of the United States of America, was: "Gerald Ford [the 38th president of the United States of America] can't walk and chew gum at the same time". This was a sanitised version of LBJs actual words: "Jerry Ford is so dumb he can't fart and chew gum at the same time." This quote highlights the importance of multi-tasking; in the context of looking at ECGs we must be able to "look & think & describe" (Figure 3). The first step in ECG assessment is pattern recognition - with experience you will identify the main finding/abnormality most of the time. Pattern recognition is associated with a "One in Five (1in5)" effect: there is a "one in five" rate of overlooking an abnormality [The 1in5 value is an 'guesstimate' based on my experience]. The next steps in ECG assessment are analysis (including measurement) and deduction. This sequence is shown as a logical progression in Figure 3, culminating in the diagnosis/diagnoses. electrocardiogram refers to the output i.e. the tracing. This is a message ("cardiac telegram") that has been sent to the observer (you/me). An electrocardiograph is the measurement of electrical activity in the heart and its recording as a visual trace (on paper or on an oscilloscope screen), using electrodes placed on the skin of the limbs and chest (Oxford Dictionary). An electrocardiogram is a record or display of a person's heartbeat produced by electrocardiography(Oxford Dictionary). So we look at an image (the electrocardiogram) that has been produced by image-taking device (the electrocardiograph). The analogy with photography is obvious. One difference between a photograph and an ECG is that we can look at a photograph passively, while with an ECG we actively assess the tracing and provide an interpretation of our observations. Let us contrast the assessment of a patient with the evaluation of their ECG. The bedside evaluation of a patient is narrative based, with a significant verbal component: history (talking to the patient), examination, synthesis of information, diagnosis (often written, with the writing including the history and examination findings) and talking to another health professional. The evaluation of an ECG is different: we look at the tracing, but we usually do not describe our step by step observations or analysis. Our initial ECG diagnosis is usually verbal, brief and sometimes no more than an 'ECG emoji'. A "look & think & describe [talk] as you look and think" approach to ECG evaluation is an essential skill for those of you sitting exams. It is also a good way of teaching ECG evaluation at the bedside. The following case is an example of this approach. The patient is a healthy 70 year old man with a history of hypertension and diet controlled diabetes who developed mild central chest discomfort associated with hypotension and "flash" pulmonary oedema. Figure 4 is the ECG on admission, and includes a computer analysis as well as the hand written assessment of the treating doctor (the "pattern recognition" phase). "Sinus tachycardia at a rate of about 115 bpm [using the computer report]. Left axis deviation is present, the QRS complexes are not widened [using the QRSD value of 110 msec in the computer report], there is probable T wave inversion in Lead 1 and definite T wave inversion in Lead aVL (which also has a small Q wave). Because of these changes in the (frontal) anterolateral leads we check the lateral precordial leads (V4 to V6) - there is slight J point depression and ST depression in Leads V5 and V6. Leads V5 and V6 have prominent S waves, suggesting possible right bundle branch block (RBBB). There is a prominent R wave in Lead V2, but no S wave in Lead I, whIch argues against RBBB. Looking at Leads V1 to V3 we see Q waves in these leads and slight ST elevation in Lead V1 to V2". Two other finding (an example of the 1in5 effect) are ST elevation in Lead aVR a prolonged QTc interval [using the computer report]. The above example illustrates a narrative based evaluation of the ECG findings. The case showed that an ECG can have a number changes of varying importance or relevance. We often (try to) reduce multiple finding(s) to a single diagnosis. In the above case this would be "changes of acute cardiac ischaemia". 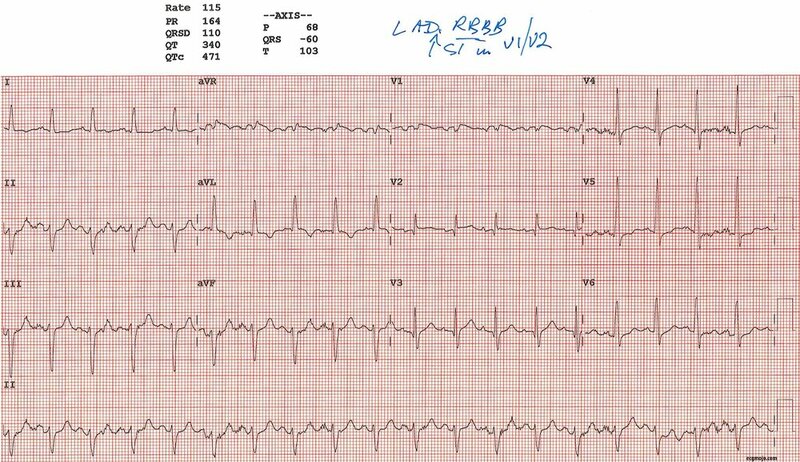 An approach to ECG evaluation based on the main diagnosis or finding has the advantage of brevity, but involves the loss of other information. A single final diagnosis is like a fingerprint - it identifies the finger (the individual [cause[s]) but does not describe the (shape of the) hand ( Figure 5). The advantage of this approach [compared to the comment "Within normal limits"] is that it reminds us to look at the frontal leads (to determine the axis), the praecordial leads (to determine the transition zone), to consider the intervals (including the QT interval) and the QRS-ST-T morphology. In the remainder of the blog the Rule of Fives will be applied to some real world ECGs (unlike the exotica encountered in examinations). Diagnosis: Possible right ventricular hypertrophy; QTc prolongation noted but not clinically relevant in this case. Diagnosis: Possible antero-septal ischaemia; ventricular bigeminy; left ventricular hypertrophy. Diagnosis: Left axis deviation; right bundle branch block; non-specific T wave changes. Diagnosis: Hyperkalaemia with absent P waves, widened QRS complexes (with a left bundle branch block morphology), prolonged QT interval, and right axis deviation. The opening sentence of WOS is "Seeing comes before words". We all develop our own way of "seeing" ECGs - but we also need to able to describe what we are seeing. The process of ECG analysis is more subjective than we realise (“There are no facts, only interpretations.” Friedrich Nietzsche), and is also a two-way process. To misquote Friedrich Nietzsche: "And if you gaze long enough into an ECG*, the ECG* will gaze back into you" (* "abyss" in the original quotation). Describing the main features of a ECG is more complex and difficult than just reaching the correct diagnosis. Competence in interpretation and description takes practice, and a standardised approach is helpful. Sometimes other priorities are more important than ECG assessment.